Kabocha squash is my favorite squash. Also referred to as the Japanese pumpkin, kabocha squash look like a cross between a pumpkin and an acorn squash. The dark green skin becomes very soft when cooked and is very much edible (no peeling needed! ), and the flesh inside is sweet, dense, creamy, and richly flavored. Kabocha is one of the first foods I turned to when I changed my diet over three years ago, and we have been in a true romance ever since. Very similar to the nutritional make up of other winter squashes, kabocha is an excellent choice. 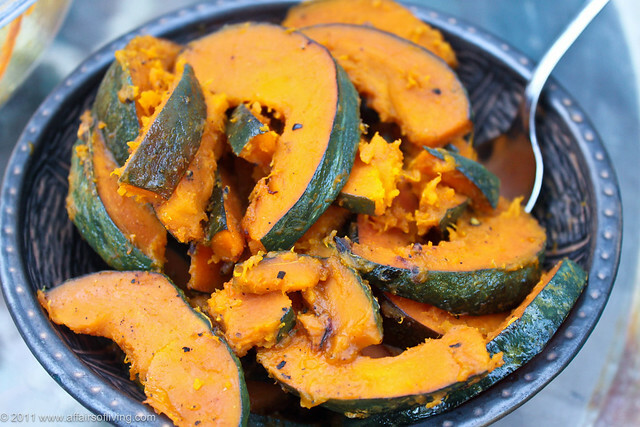 Winter squashes are full of complex carbohydrates and digestion-stimulating fiber. This means that they have a relatively low glycemic index, so your blood won't sugar spike and your metabolism will remain more level. It is jam-packed with loads of nutrition, boasting admirable amounts of vitamin A, vitamin C, folate, and even some protein. From an energetic standpoint, kabocha squash is extremely warming and grounding, and helps to nourish and support the spleen and pancreas. Therefore, it is often suggested in Chinese medicine or macrobiotic diet plans as a way to strengthen digestion and support overall health. I use kabocha most often in a variety of Japanese-inspired dishes, soups, roasted, steamed, or in sautes and stirfries. In addition to savory dishes, kabocha is a natural addition to sweet puddings, in smoothies, or used in breads, pies, or custards in place of pumpkin. I have even mixed it with nut butter, coconut oil, maple syrup, and cocao powder to make frosting. Yum! I love kabocha because the rich, sweet flavor satisfies my cravings for sweet bready things, so sometimes I'll roast it and have it on hand for dessert. Sprinkled with a little cinnamon with a drizzle of melted ghee and a drop or two of stevia, it's a very decadent tasting treat! So, get creative. Last night my housemates were grilling fish, so I made coleslaw and made roasted squash to contribute to the meal. Roasted at a high temperature, my squash hardly took anytime to cook. Served with plank-smoked salmon, rhubarb coleslaw, and pickled asparagus, it rounded out the menu for our impromptu al fresco dinner. I hope you enjoy! 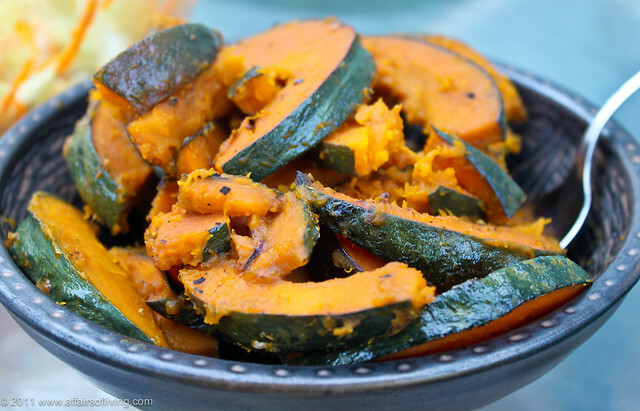 Cutting the squash into thin wedges and roasting at a high temperature makes this an easy and quick way to enjoy squash. I like adding chicken broth to the pan while the thin slices of squash roast - it makes them cook more quickly, helps keep them tender and moist, and adds a wonderful depth of flavor. optional: other seasonings such as chili powder, Penzeys Adobo Seasoning Mix (my favorite! ), garlic powder, tamari/Bragg's aminos/coconut aminos, etc. Preheat oven to 500º F.
Scrub the outside of the kabocha squash well with vegetable wash/castile soap and a brush. Rinse well and pat dry. Halve the squash with a large sharp knife, then scoop out seeds. Cut the squash into small wedges about 1/2-inch thick. I think the easiest way to do this is to cut each half squash into quarters, then place each quarter skin side down and slice lengthwise into thin, long slices. Place slices in a baking dish and drizzle with oil, and toss to coat. Pour chicken broth into pan over squash. Sprinkle with salt and pepper (and any other spices as desired), and and place in oven. Bake for about 15-20 minutes, stirring squash occassionally, until slices are tender and lightly browned. Most of the broth should absorb into the squash or simply cook off. Remove from oven and serve, adding additional seasoning as necessary. Recipe: Who needs potatoes when you have Parsnip Apple Mash?